As the conference is named Getting Real and this dispatch is of a more personal nature, my job here is to, yes, keep it real. That’s why I must confess: when I'm really enthused about something, I use rhyming expressions. My response to my Wednesday Getting Real experience? It rocks my socks. In fact, it's the bee's knees. All day, I felt the enormity and depth of the wisdom, talent, experience, passion, creativity and intelligence surrounding me, during every panel and presentation, in every gathered audience. Whether or not we find our way in this world depends on people like the attendees at Getting Real. They're working to expose injustice. Dismantle stereotypes. Empower the disempowered, the "othered," the ignored. Ask the difficult questions. Call for and make change. I'd like to share a couple of moments from today that left me feeling especially grateful. In the morning, I attended an all-female panel addressing "Journalists Under Threat." It was affirming to see and hear from these brilliant women about how journalists can better mitigate risk when filming in high-risk situations. 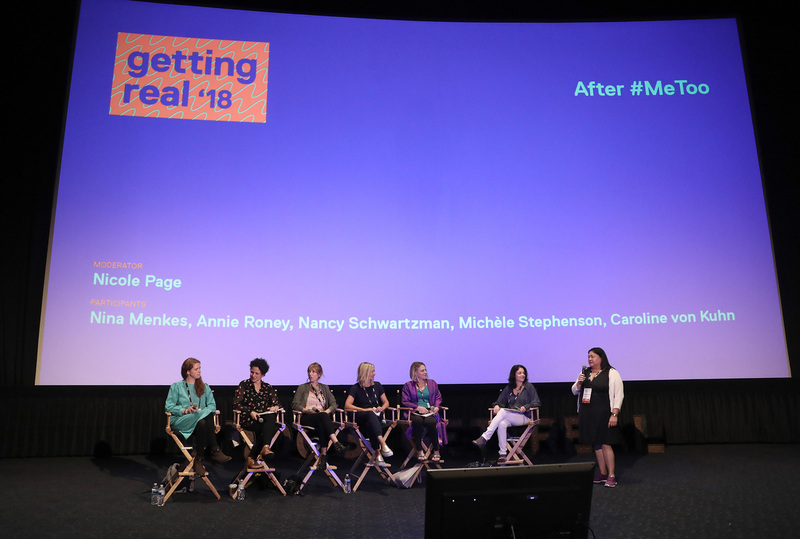 During the "After #MeToo" panel discussion, noted filmmaker Michéle Stephenson kept the conversation grounded in intersectionality, reminding the crowd that "In terms of a conversation, in my storytelling practice, I intentionally try to work from an intersectional perspective. We can’t talk about #MeToo or other movements without talking about their intersectional nature." Stephenson encouraged us to spend time in reflection to work on a more intersectional lens. "There's introspection we have to do in our daily practice regarding what work we have to do," she maintained. Yes. I want to see equity at the intersections of gender, race, class, sexual orientation, age and disability. After the #MeToo panelists spoke, audience members asked questions. One woman shared her experience as a female filmmaker who has experienced harassment and worse, and has so far found no refuge in supposed female allies. In fact, their response, she said, has been "crickets." She shared her story with a room full of strangers, and her courage to do so empowers others, and me. I knew Getting Real would deliver the knowledge, but I did not expect it to offer emotional sanctuary as well. About the knowledge…I got a lot of it today: tips, best practices, processes, resources… Frederick Wiseman’s workflow. Yes. You read that right. This morning, I sat in the second row of the Cinerama Dome Theatre and listened to Frederick Wiseman describe in detail his entire process for making a film, from start to finish, philosophical framework included. He described himself as a "crazed, obsessional, devoted filmmaker." Documentary friends, believe me when I tell you, I thought I might pass out from happiness. He revealed that his process involves little research and no preconceived theme. His workflow for Ex Libris—The New York Public Library began with spending half a day there prior to filming, then spending a few weeks filming with a three-person crew (Wiseman on sound as well as directing, plus a cinematographer and assistant). Wiseman edits the movies himself, taking six or eight months. He selects sequences when "something spectacular happens. You don't create it, but you stumble across it and your job is to recognize what it is —a good sequence." The model for this kind of filming, Wiseman noted, is Las Vegas: You hang out and take a chance. (Which also describes the human condition. We're all on this planet, hanging out, taking a chance.) Wiseman starts without a theme, films at a single geographical location, and allows the film to emerge in editing. He spends six to eight months editing sequences thinks he might use, then three to four days to create the first assembly, which is usually about 30 to 40 minutes "too long," then he spends another six to eight weeks on internal rhythms, structure and sequences toward a dramatic narrative. While editing, he watches the entirety of his 150 hours of footage a second time. Imagine watching 150 hours of footage of people just…being, going about their workday—until you discover something spectacular. Wiseman revealed that he always finds something in this second pass that he missed the first time around. I celebrate this aspect of his process because it is highly disciplined, and all in service to the film. It would be easy not to do that second pass of the entire 150 hours. But Wiseman does it. And his films, he believes, are better for it. This process-workflow stuff reverberates through my soul. I shared a few of today’s highlights. But truthfully? It felt like this all day. Memorable moment after memorable moment. Everywhere, I saw people interacting, meeting, smiling, listening, talking and engaging. I had so many fun conversations with folks about their work, the conference…and life. I met people from all over the country, spanning the documentary continuum. It's exciting to be part of this intentional community, building what will further the work of documentary filmmakers all over the world. Suz Curtis is a Los Angeles-based writer. Her co-written narrative short Down to Nothing, featuring Twin Peaks' Sheryl Lee, is scheduled to be released in 2019. A graduate of UCLA's MFA Screenwriting program, she's currently working on two feature documentaries with Ladylike Films (as associate producer) and Zemma Productions (as writer).